Thursday night, after two bottles of wine with Bill, we spent a lot of time and money enjoying all that Bourbon Street had to offer, and I paid for it all day Friday. 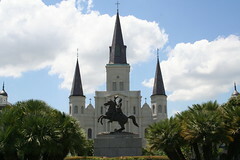 We ventured out to see Jackson Square and St. Louis Cathedral, Cafe du Monde, and a few other major sites, but I spent the bulk of the day in the hotel room convalescing. Not exactly how I wanted to spend our romantic weekend. Saturday morning we rode the street car out to the Garden District to look at the fancy houses. 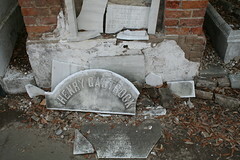 We stopped first at the cemetery and marveled at the age and number of occupants of some of the tombs. 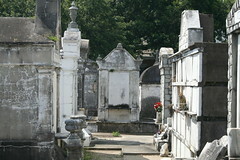 We walked for a bit around the Garden District, but quickly tired in the heat and humidity. 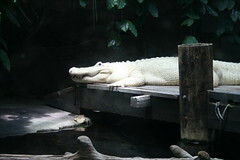 When we returned to the French Quarter we visited the aquarium for an easy-to-do air-conditioned activity. 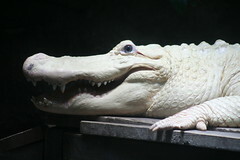 The albino alligator was absolutely stunning. Carina and I were convinced that it was a replica on display until the thing closed its mouth and moved its tail. Re-energized, we took the ferry across the Mississippi River for a stroll around Historic Old Algiers. There’s not much there outside of Mardi Gras World, which we decided to skip. We had a late lunch at Tout de Suite, a little cute diner that was horribly understaffed, and then rode the ferry back to the French Quarter. 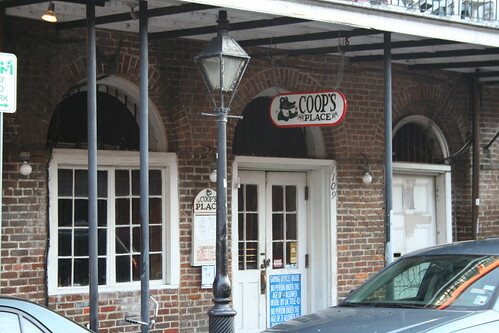 Upon Bill’s recommendation we ate dinner at Coop’s, and absolutely loved every morsel served to us. 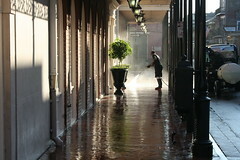 Sunday morning I woke early and took a stroll throughout the French Quarter while Carina slept in. it was a very different experience to walk around the French Quarter at 7 AM, though I was hardly the only person up and about. 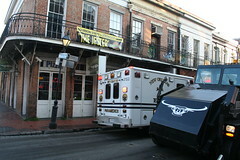 As I walked up to Bourbon Street it was not entirely incongruous to see an ambulance passing one way and a street sweeper passing the other. Lots of people were hosing filth off the sidewalks of their establishments, and I passed a fair number of people jogging or walking their dogs. I only saw two or three obviously drunk people, though I did note that a number of street performers were sitting in the early morning shade with beers next to them. 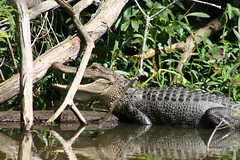 I returned to the B&B in time to wake Carina for the swamp tour we had booked for the day. When looking at the available tour options, we elected for the swamp because it’s the one thing we’re unlikely to see anywhere else any time soon. Our guide, Captain Gerry, was an affable and articulate man who really made the trip worthwhile. He was clearly passionate about his homeland, and imparted on us his own deep sense of respect for mother nature. We learned the difference between a swamp and a marsh, an awful lot about alligators and cypress trees, and a little bit of Louisiana history. Capt. Gerry surprised all of us when he threw marshmallows to an alligator swimming in the water. He calmly explained to us that he refused to throw meat, nor to use meat to attract alligators to the boat, and that they loved marshmallows! Even though there hadn’t been a single recorded alligator attack against a human being in Louisiana for a long time, Gerry did not want to encourage the gators to associate human beings with meat or easy meals. 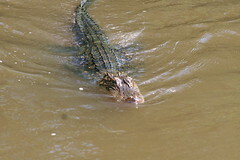 While Gerry wasn’t afraid of a lone gator, he was extremely concerned about the possibility of three or four gators investigating a tour boat that had been throwing meat to them: an alligator can launch its body more than halfway out of the water, and all it would take is one inquisitive – never mind aggressive! – gator to jump onto a boat to hurt a single passenger. We passed several other swamp tour boats operated by different companies, and we all shared Gerry’s deep disappointment to watch the boat operators put hot dogs on sticks and splash them about in the water. Alas, it’s not illegal, so there was nothing for us to do but feel glad that our guide was a bit more cautious about the matter. We had po’ boys for lunch at Johnny White’s – Carina had roast beef and I had oyster – and then took a short nap back at the hotel. We joined Bill again for wine, and chatted comfortably for a bit. 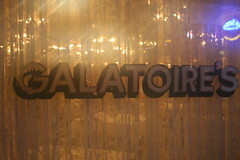 Bill helped us try to make reservations at K-Paul’s (closed) and Nola’s (booked), so we ended up eating at Galatoire’s, a restaurant recommended to me by a co-worker before we left. The service was phenomenal. When we were seated, the host asked us if we had a server who usually took care of us, to which I responded no. “You will soon,” he replied, and whisked away to seat someone else. 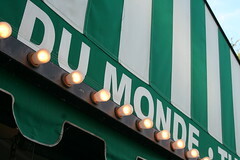 He was right: if we ever go back to Galatoire’s, I’ll absolutely ask for Shawn to take care of us. The food was absolutely exquisite. Oysters Rockefeller and sauteed shrimp appetizers preceded the most delicious sirloin I can remember. After dinner we strolled down Bourbon Street, in no particular rush and with no particular destination. It was fun to watch the city get crazy around us, but not to get swept up into that craziness. We stopped for a few drinks, and enjoyed holding one another’s hand in quiet contentment as we casually made our way back to the Ursuline Guest House. Monday morning we left for home. My mom always encouraged me to view every trip as a reconnaissance mission for the next time I would go to that destination, and that advice has always served me well. This weekend Carina and I were able to do what we wanted to do, while taking notes for things to do when we visit New Orleans again. We’d love to spend a few days there with a few friends. Hopefully we can make that happen sooner, rather than later.